« Five Happy Things: Birthday Celebration Week! My blog, the Practical Free Spirit, turns two this week. On Saturday, June 30th, to be exact. This is my 223rd post. I just read my first post, Originality: Having Something to Say. I didn’t know what to expect, but it’s not so bad. It sounds like me two years ago, which isn’t, after all, so much different from me now. Would you like some more data? I’ve taken time off for vacation a few times, but other than that, I reliably post twice a week. I’ve never failed to post when I was planning to do so, although I’ve come close once or twice. The blog gets an average of 105 comments per month (thank you for joining the conversation!). Probably about half of those comments are from me, although I’ve been falling a bit behind in the past few months. The highest traffic month in the blog’s life was April 2012. The most popular post is What is a Free Spirit?, which is apparently more of a pressing question than I would think. (Thank you, Google Search.) Other popular subjects include those I was afraid to write about, introversion, and cool Star Wars pictures. I am still on a quest to bring some much-deserved cuteness fame to Nala because what good is having a blog if you can’t occasionally cute-bomb your long-suffering readership? 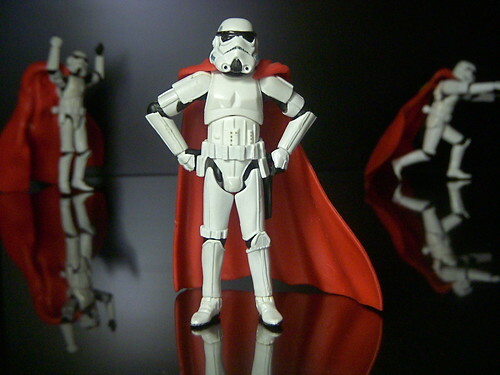 Storm troopers create new lives for themselves fighting crime. I don’t know much about my readers, actually, except the ones who comment. I wish I knew more. I wonder about you sometimes. It’s a strange sort of intimacy we have because I suspect there’s a significant part of me that you can get to know pretty well if you read regularly. Not the entire me, of course, but an important part. I talk about what I care about here (really, there’s no point in me writing a 500-word essay about something I don’t care about). I talk about what I’ve been thinking about. I link to the most interesting articles I’ve read. Once in a while I get teary-eyed while I’m writing one of these posts because it matters so much to me. I read articles about what I “should” be doing with the blog, and then I ignore a lot of what I read, because we are friends, you and I. And a lot of those shoulds sound sleazy or cheap or fake to me, and I can’t bear to do them. Not to the blog, which has taken on a life of its own. It depends on me, after all; I breathe life into it. I am responsible for it. Before I started, it didn’t ever occur to me to think of a blog as a living entity, and perhaps many blogs aren’t. But this one–well, it just might be. I am going to ask for a birthday present now, for me or for the blog, or for both of us. Satisfy my curiosity, leave a comment, and tell me about yourself. Who are you? What do you like about this blog? What do you wish I’d do more or less of? What are you glad that I don’t do (and you hope I never start)? What subjects do I talk about that give you a burst of satisfaction? I would really like to know whatever you’d like to tell me. Hello! You know me from Real Life! One of the things I love about your blog is that it reads like you and I having a conversation, so I read it in your voice, and that makes me happy. I like that you write about a variety of topics, but the stuff you write about just living life are my favorite. I think I relate to them because I write the same kind of thing, and we’re both looking to engage through interesting questions of our readers. I think it’s amazing and awesome that you’ve been able to maintain such a healthy posting habit. When I was blogging daily it was tough, but I had a format, and my posts were small. But after leaving that routine, I wasn’t able to post less but more substantially (like you do), so I love that you can. Also I’m happy to hear I sound like me! Thanks, Mike. Hmm. About me. My name is Paul. I’m a Dad/Web Developer/Database Admin/Writer (when not procrastinating on the internet). I belong to a monthly writing critique group that has saved my writing (built-in audiences with opinions are great!). I don’t think you should change anything about this blog. I like particularly the posts about writing. Hi there! You know me too, and we’ve known each other for two whole years now! Just like the blog, so that’ll be easy to remember. Not that we could forget Taos! I do love your more personal posts, although I also appreciate the writing ones. My favorite post thusfar is “Being an Introvert is Awesome!” because I really connected to your words, your thoughts, your enthusiasm. Thank you for that post! Thanks! And I’m glad if I’m encouraging–I know I find encouragement all around the internet myself. It’s nice to know there are other people out there struggling with similar things. You also know me from real life, know not especially well, through a mutual friend who introduced you as “another person who loves Buffy and also looks like Amy Acker!”. I would see your blog updates through G+ and occasionally would click to see more. The first article to get my attention was “Want to get to know someone better? Travel with them” followed by “The Thailand Test”. As of a week or so ago I finally subscribed. Your blog is overwhelming positive. In a culture where satire and sarcasm are the norm, it is refreshing to find something genuinely positive. I really like that. Plus, it is really neat to say that I actually know one of the authors/bloggers on my reading list. Thanks for commenting. I don’t usually think about it, but it’s true that a lot of the Internet is full of sarcasm and making fun, etc, isn’t it? Huh. I’m pretty happy to be an island of something different. I’d just say keep doing what you are doing. I find your posts very relatable and I don’t have any critical do’s or dont’s. I suppose, as with most blogs I read, if there is a post that doesn’t resonate with me, I move on and forget about it quickly. But when something does strike a chord it is revelatory in the best possible way, and I find that happening with your blog more often than not. If it’s important to you, chances are that it will be important to a lot of people, so keep writing and I’ll keep reading. Oh–I know you in real life, though only once a year. Will you be at the conference? Hope to see you then! I will be! Can’t wait to catch up. 🙂 And thank you for your kind words. I will keep writing! I think you include lots of helpful and positive insights in your posts…there’s good variety and your “voice” really shines through…I’m not a “writer” but it’s interesting to read your own perspectives, from a writer’s point of view. I had lots and lots of checks in most columns…filling that page in after making “pages” or posts seems to help to show me that I have multiple positive motivations and intentions… and part of the reason for the chart was that I was trying to “teach” myself that if I have/had good positive motivation while/for creating, that the reactions of others aren’t/don’t need to be a prime concern…..an ongoing challenge for me..
Hello from Australia. I’m an IT professional, and I don’t know you in real life, but I do know your husband (well, I’ve met him). In fact, I believe I found your blog by following a link he posted. What I like about your blog… I think both the variety of subjects you write about, and the very “no-nonsense” (as you say, practical) way in which you go about them. I can relate to many of the things you write about, and most of your articles make me think. Your article on the joys of being an introvert, for example, really worked for me. I haven’t really been around here long enough to truly get a feel for what I do and don’t like about your blog, but I do know that what I’ve read so far has generally been very thought-provoking. I circled Yonatan right after I joined G+, on the advice of our college friend Tim Akers. Then Yonatan kept sharing your really interesting blog posts, and you always eloquently expressed great insights, usually on things very relevant to my own interests. I’m not a writer and never will be, so I don’t often feel like I have a lot to add, but I always enjoy reading what you have to say, and I think we probably have a lot in common, even if our passionate pursuits diverge. I finally took the leap to circle you after your post about intelligent women. A little about me: 12 years ago I married the guy I fell in love with in college (one of Tim’s former housemates, actually) 20 years ago. We moved to Oakland 6 years ago next month (or last month, depending on which one of us you ask – I stayed in NC an extra couple months to finish a few things up) and have fallen in love with the Bay Area. The number of nerds, geeks, and people who live conscious, thoughtful lives, is huge here, in addition to the wide variety of cultures that interact coexist – and I loveit loveit loveit. I have way too many things going on at any one time; I love to read and to knit but haven’t had enough time to do much of either of those lately due to running two businesses (I make jewelry and knitting notions, and I’m a photographer) on top of the Day Job (TM). I love tabletop games – kind of hooked forever on Settlers due to college friends who worked at Mayfair way back in the day – and while I’m not much of roleplayer myself, I always find myself friends with people who are. It’s great to meet you, Lisa! From reading about you, yes, I would completely agree that it sounds like we have a lot in common. It sounds like you are doing so many awesome things, too! I also like meeting people who have started their own businesses because there’s a kind of solidarity in it. Happy birthday to you and the blog🎉🎈💝! Keep on being true to yourself, 1st time engaging with you through this medium. For me this platform allows for reflection, introspection and celebration of one self. I appload you for the will, enthusiasm and passion you have. Keep on doing what you do, your soul will continue to guide you to do what is comfortable for you. Enjoy the gift and write on….. Brand new reader here …via your DSF story. I gave it 7 rocket dragons. Loved that last sentence. Ahh, those ‘should’ articles … my thoughts on the matter are these. If t’aint broke, don’t fix it. I try to avoid the “should” articles because people are so different. Just because I’m doing something doesn’t mean it would be good for someone else. Although I’m human, so I bet I’ve done it accidentally! Happy second blog birthday! As a middle age retired teacher I enjoy your blog because of your positive style on the topics you write about. It helps me keep in the loop a bit but i also have a 30 year old son who updates me on things. I also like to have time to write and enjoy the quiet peace of my backyard garden. Thank you! I love that phrase: “the quiet peace of my backyard garden.” I have all sorts of beautiful pictures in my head now. Happy birthday, Free Spirit. I like blog comments, and this is one of them. Anything else you know about me will be pulled with a spork. But seriously, I like the way this blog makes me feel that it is okay not to be a machine when writing. All kidding aside, thanks for the comment. Happy Blog-birthday! I live in Florida and finishing up a history degree at age 30. I had a LJ that almost nobody really followed (mostly some friends) that started during my original time in college and was very therapeutic. It eventually trailed off over the years. I was linked here for an interesting entry and have stuck around because I enjoy the writing. Additionally, I keep hoping this blog will help motivate me to write, but I can’t seem to make writing a priority despite “wanting” to (I put it in quotation marks because I suppose if I truly wanted to I would), praise for my writing from my teachers, compliments from others that I “have a way with words”, and ideas for what to write about. Hey there! Does this mean you’ll finish the history degree soon? Nice. You know, I wonder what flips the switch in terms of writing motivation. I have a colleague, Luc Reid, who studies that kind of thing, but I think his focus is on writers who have made that first leap, the one to commit and take it seriously. I think this happens at different times for different writers; I know for many years I just wasn’t ready to do it. My name is mara and I’m in the process of writing a YA dystopian and a few picture books (various stages). I love coming to your blog because of your honesty. You manage to bring yourself and your life to your blog in a way that isn’t whiney or self-absorbent, but instead is totally relate-able. I’ve commented a few times on your posts and I don’t do that often.